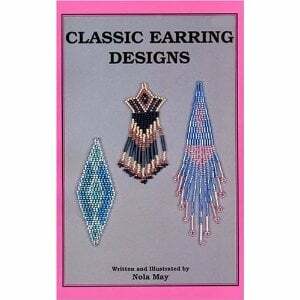 This small paperback book entitled “Classic Earring Designs” is written and illustrated by Nola May. At $9.95 it is an affordable introduction to ‘Indian’ style beaded earrings made with small glass beads. If that sounds like a sentence I’ve written before it is because this small book is published by Eagle Publishing who put out ‘Delightful Beaded Earring Designs‘ by Jan Radford which I reviewed previously – and it is very similar in many ways to that book. Check out this book now! Pertinent sentences from the review of ‘Delightful beaded Earring Designs’ which apply here as well include “It has a somewhat dry, thin feel to it, but for someone interested in a straightforward text on the subject it should be useful”. “The text exhibits a good understanding of tools and materials”. “It might too be a good way for someone to start jewelry making and again, for a person who wants to learn the techniques for beaded earring making this book will work.” A serviceable and friendly text on the subject. I’d recommend this book to anyone wanting to know how to make beaded earrings. By beaded earrings is meant small glass beads knotted onto strands, they look ‘Indian’ or ‘Hippy’ as a 12 year old friend of mine might say. If you are not familiar with the form these are flexible earrings of threaded small glass beads in different colors and patterns. Lots of geometric patterns because of the tying methods used. Because of the gridding effect of the knotting techniques the patterns are like blown up pixels on a computer screen or have the slightly jagged look of weaving patterns. Patterns are rhythmic, strong, simple, dangly, arranged in bands or registers of repeated patterns. The glass beads catch the light and are sometimes almost iridescent so the jewelry is concerned with movement, light, shadow, rhythms and patterns. In North America you might term them a ‘vernacular folk art’, that is a craft form which has developed from ordinary people, a ‘folk’ art. It is 92 pages, has many many good diagrams showing beaded patterns and the steps required to make them and has eight pages of color photographs of finished beaded earrings. There is something interesting about Eagle’s View Publishing: when reading the acknowledgements one can’t help but feel they are supportive of women writers and passionate individuals arising out of the so called ‘crafts’ scene (which some people equate with bake sales and hobbyists – implying that the work is not serious or worthy of attention). I once ran across a female embroidery teacher at a workshop who agreed that what she was doing in the guise of teaching embroidery techniques was consciousness raising and Eagle’s View Press has a little of same feeling, in the guise of books about beaded earrings they are consciousness raising and valuing the work of their authors, raising self esteem while contributing to ways for people to express themselves within the crafts, and with jewelry making in particular. I would recommend this book as an introductory book to the genre, it has good step by step diagrams and how-to’s. There is a solid list of materials and tools and a fervent wish from the author that ‘you become a great bead designer.’ This kind of thing is a great starter for someone interested in the jewelry field, for someone interested in ‘ethnic’ or ‘country’ style vernacular (regular person) jewelry, or as a way of using craft work for personal fulfillment and happiness through crafting objects, however apparently simple they are. This is the kind of book that would do well for someone wanting an easy way into jewelry making or it could be in a public library for the same reason. A nice, warm book on the subject.